Greetings to all of my esteemed video programmers across the country! It’s Andy Gesner and the staff from HIP Video Promo. 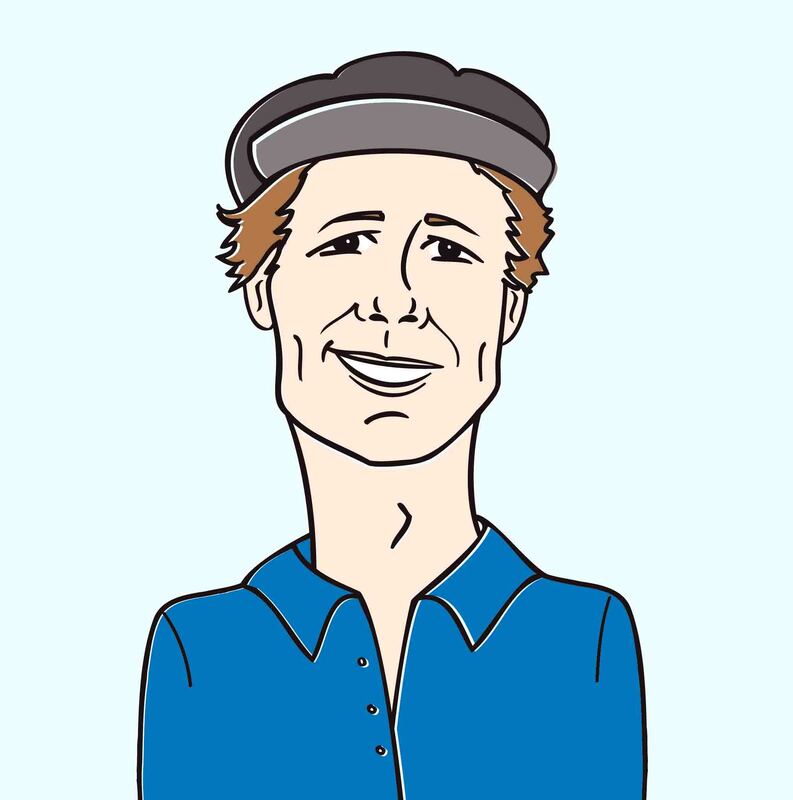 Here at HIP, we get plenty of clips with all kinds of imaginative twists – animated shorts, elaborate stories, abstract interpretations of rock and roll songs. And all those are great, to be sure; but there’s something about performance footage that can’t be improved upon. Maybe it’s because there’s no special effect in existence that’s as dramatic – or as compelling – as a terrific, tight combo in action onstage. Martin Scorsese knew that when he shot The Last Waltz, so it’s not surprising that the traditionalist blues and Southern-rock groups who’ve followed in the footsteps of The Band have shot some of the most unforgettable performance video. Add The Deadstring Brothers to that list: their clip for “Sacred Heart” shows the Detroit quintet tearing the roof off of a small club, and it’s an exhilarating four-minute watch that needs no ornamentation or adulteration. To be fair, a performance clip is the only proper video accompaniment for a Deadstring Brothers song. 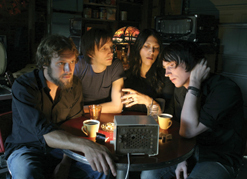 This is a band well-known throughout the Midwest for their phenomenal live show, and the members have toured the nation relentlessly, sharing stages with like-minded artists such as Jesse Sykes, the Mekons, the Drive-By Truckers, and My Morning Jacket. Unlike the stereotypical Motor City rock band, the Deadstring Brothers draw as much inspiration from the honky-tonk as they do from the garage; what they share with their Detroit peers is tremendous ferocity, a nasty edge, and a willingness to go for broke. Starving Winter Report, the group’s second album, is a smoking collection of Stones-like rave-ups and gorgeous mid-tempo numbers reminiscent of Music From Big Pink. Frontman Kurt Marschke crunches out Telecaster chords with unwavering conviction – but he also proves himself to be an adept handler of traditional instruments like dobro and mandolin. The potent voice of Masha Marjieh joins Marschke in sweet harmony on all ten numbers; it might be accurate in letter to call her a backing vocalist, but in spirit, she’s more of an adjunct frontperson. On “Sacred Heart”, the lead single and kickoff cut on Starving Winter Report, Marschke and Marjieh raise their voices together, and their power is mutually reinforcing. The relationship between Marschke and Marjieh is a focus of Nicolas Hill’s energetic video for “Sacred Heart”. The two singers dominate the small club with their presence, addressing their microphones with relaxed authority. In a memorable shot, Hill catches the vocalists in profile, Marschke’s face peeking out from behind Marjieh’s, a red stagelight glowing beside them both. Chemistry positively pours from the frame: it looks like it could be the LP cover of some forgotten classic. Meanwhile, organist Ross Westerbuhr crouches over his B-3 like Garth Hudson, bassist Philip Skarich bathes in a golden spotlight, and drummer E. Travis Harrett slaps the skins in front of a waterfall of tinsel. There’s nothing extraordinary about the club, or the patrons – but that’s what makes the scene so convincing. It reminds us of the indisputable magic of the rock and roll basics: something about which bands on Bloodshot Records need no reminder. Other clips on the Bloodied But Unbowed: Life In The Trenches Bloodshot compilation CD may be more spectacular, but none encapsulate the collection’s (and the roster’s) virtues any better than this. Here at HIP, it is our pleasure to work with Nan Warshaw, Rob Miller and the awesome crew at Bloodshot Records. We’ve got Starving Winter Report CDs and other goodies and we’re ready to meet all of your on air giveaway needs. The Deadstring Brothers will be on tour in the US in late October through early November, so if they swing by your area let us know and we’ll be sure to hook you up with a video interview or video ID! If you need more info, call Andy Gesner at 732-613-1779 or e-mail us at HIPVideo@aol.com. 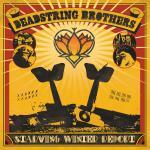 You can also visit www.deadstringbrothers.com or www.bloodshotrecords.com to find out more about The Deadstring Brothers.